The crew of Sara G are Double World Record Holders!! Click here to see press release from the World Ocean Rowing Society. Go to the Media page to see images from the arrival in Port St Charles Marina, Barbados at 11.16GMT on Tuesday February 8th 2011. Here you will find information on my row across the Atlantic, the crew and my chosen charity. Just click on any of the links above to take you to where you would like to go or if you wish to make a donation towards the row, please go to the Charity/Sponsors page. On January 2nd 2011, I will begin one of the world's toughest endurance challenges and set out to row across the Atlantic Ocean. 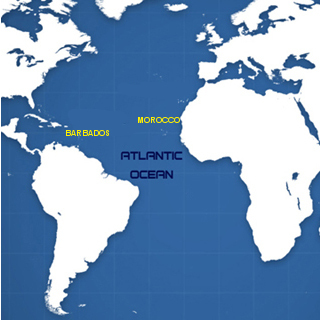 As part of a 6-man crew, I will start from Morocco and finish in Barbados in the Caribbean. It is over 2,500 nautical miles and can normally take anywhere around 50 days to complete. However, this time, we are aiming to break the world record and complete it in under 33 days and 7 hours! You can find out all about the crew and the plans for the row at World Ocean Rowing's website - click here. The race itself is the final leg of a journey that will have lasted over a year at the point of departure. In order to get to the starting line there are many other challenges that I am overcoming. Firstly, there is the intense physical and mental training that I am undertaking. Then there is the challenge of raising the estimated finance needed to pay for all the costs involved. I also have to complete a number safety qualifications including the RYA Basic Sea survival and First Aid at Sea qualifications. In taking part in this event I will also be helping to raise funds and awareness for my chosen charity - Energy Action. You can find out more about them on the Charity/Sponsors page. UPDATE: Tues Feb 8th - Message from Adam: "Success!! We beat the world record by about 11hrs!! I've never been so exhausted or delighted in my life. I'll get in touch with everyone over the next few weeks but for now let me just say THANK YOU to everyone who supported me. It belongs to all of us. I'm going to sleep for a week straight!" UPDATE: Tues Feb 8th - Sara G arrived in Port St Charles Marina at 11:16GMT on February 8th 2011 and became the fastest boat in the history of ocean rowing !!! UPDATE: Mon Feb 7th - Sara G ETA between 9.00 & 11.00 Feb 8th Port St Charles, Barbados. Hallin Marine arrived at 20.02GMT Monday Feb 7th, breaking the world record set by La Mondiale - Sara G has to arrive less than 27hrs 12mins after Hallin Marine in order to become the new world record holders! UPDATE: Sat 30th Jan - click here to download the .mp3 of Adam's LMFM interview! UPDATE: On Jan 22 2011 at 5:30GMT,the Sara G passed the halfway point ! Time elapsed - 16 days 16 hours. Distance from the Start and to the Finish - 1629.5 miles. UPDATE from Adam on the Sara G (Tues 18th): "Weather took a turn for the worse yesterday about lunch which meant our speed reduced a bit. We were trying to get a record for the most amount of consecutive days with 100+ statute miles. We are on 9 but it will be down to the wire if we can get it today. Hard, hard rowing all night so we’re very tired this morning.Still in good spirits though and confident of returning to our proper speed soon. Lots of fish turning up now - flying fish on the deck, Dorado under the boat and Tuna fish taking a pop at the smaller fish every now and again. Prob also a few bigger predators knocking about so a swim is out of the question! !Counting the days down now. We will be at our halfway mark on Thursday roughly but really that will be well over halfway if you include our journey down from Agadir". UPDATE from Adam on the Sara G (Sat 15th): "A lot of people are asking about speed and how come it fluctuates so much? Simple answer..winds, current and swell. These are changing constantly but every now and again they align to all go in our favour. We are due to have some good winds over the next few days so we should keep making 90 nautical miles for the short term future.We are still on track to break the record at the min but having done just under a third of the journey, a lot can happen. We are only racing ourselves as we feel that we are strong team. We wish the others the very best of luck and above all, a safe crossing. We also have a very experienced captain who knows how to get the best from the boat. There is also a big amount of luck involved in catching the right winds. The other reason the speed changes is due to shift changes or the use of the toilet. Its updated ever 20 mins via a system called AIS to the website. We’re cruising along nicely today and morale is high". UPDATE from Adam on the Sara G (Thurs 13th): "Expected winds were not as severe as 1st thought. We can still make some good headway now! A difficult slog last night against choppy waters making about 3 knots average. Sore hands and lost most of my fat. Eating more now than ever thought. Crew in great spirits in this boat that is built like four star hotel..but without the four stars!" UPDATE from Adam on the Sara G (Wed 12th): "I can't believe we have done over a week already. There are times when its great fun and other times when have no idea why I decided to do this. My body is coping incredibly well considering the pressure I'm putting it under. Like the others said before I left, its really a mental thing. The night time shifts are the worst as the drag on for what seems like days. My favourite shift is the 4-6 one because its cool (less than 40)! We’re due to get some big waves later today but and the wind is due to calm". UPDATE from Adam on the Sara G, 10/1/11: "My shifts are 4-6, 8-10, 12-2, 4-6, 8 – 10, and 12 – 2. The night time ones are the worst..they seem to go on forever. Very hot during the day..must be about 35-40 degrees. The good winds finally came last night and as you probably saw the miles started to go up....the cabin is a complete sweatbox though during the day and it makes for very uncomfortable sleeping..straight after a shift the routine normally involves eating and sleeping. The lads are great fun and the team spirit is like nothing I've experienced before. If we can stay in favourable wind we will have a great chance of breaking at least one record: the most amount of miles done in a day, the highest average speed over this distance and/or the quickest crossing". UPDATE, 9/1/11: Sara G reached 6 knots (approx. 7 miles per hour) a couple of times this weekend! See charts comparing Sara G with with world record holder, La Mondiale, and current competitor, Hallin Marine, on The Ocean Rowing Society's - click here. UPDATE from Adam on the SaraG, 7/1/11: "We set off yesterday from Tarfaya with good conditions and began making good miles. However after about 12 hours the wind picked up directly against us and got up to 20 knots. It is due to swing round at some stage tonight and then should help us make some big miles. There are a few other teams leaving the next few days that you can also check out on the Ocean Rowing Society's page. Some shifts, particularly those at the early hours of the morning are tough but overall I am enjoying it and believe that we have a bloody good chance to get this record now! I'm holding up well but have lost all my extra body fat already. It's hard to keep eating but I've increased my intake today to about 4500 cals. Saw 2 Whales today too". UPDATE, 4/1/11: Adam & crew arrived safely into Tarfaya port (Morocco) shortly after 9pm last night (Mon 3rd Jan) to unload the engine & recharge their batteries! They are planning to leave at 1pm tomorrow (Wed 5th Jan) to start their world record attempt, hoping to catch some trade winds along the way! UPDATE, 2/1/11: Adam & crew departed Agadir at approx. 3.45pm on Fri Dec 31st on engine to make their way to Tarfaya port (further down the coast of Morocco) - a journey they estimated at approx 40hrs. Unfortunately, they ran into engine problems so had to take up the oars early & are due into Tarfaya tomorrow eve (Mon 3rd) and will start their world record attempt soon after!